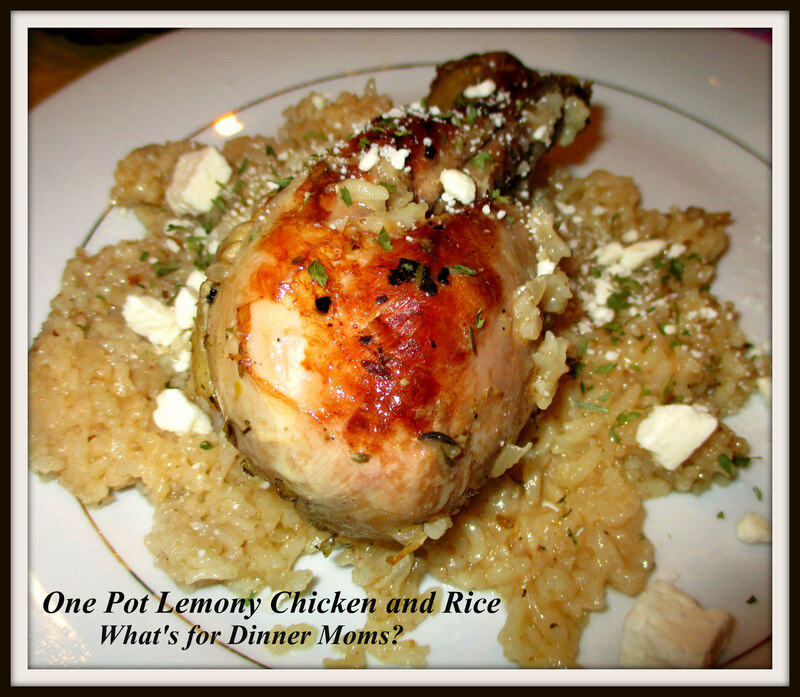 One Pot Lemon Chicken and Rice – What's for Dinner Moms? I had planned this for dinner the other night but when I went to get the chicken out of the refrigerator it was still frozen solid. So, instead I added the marinade to the bag of chicken and let it sit overnight to thaw some more. Sometimes our best intentions need to be changed and they lead to delicious accidents. This one pan meal is great on busy nights because once the chicken is browned you put the entire dish in the skillet and put it in the oven to bake. Simple. You can do whatever you need to do while it is cooking. This was delicious! 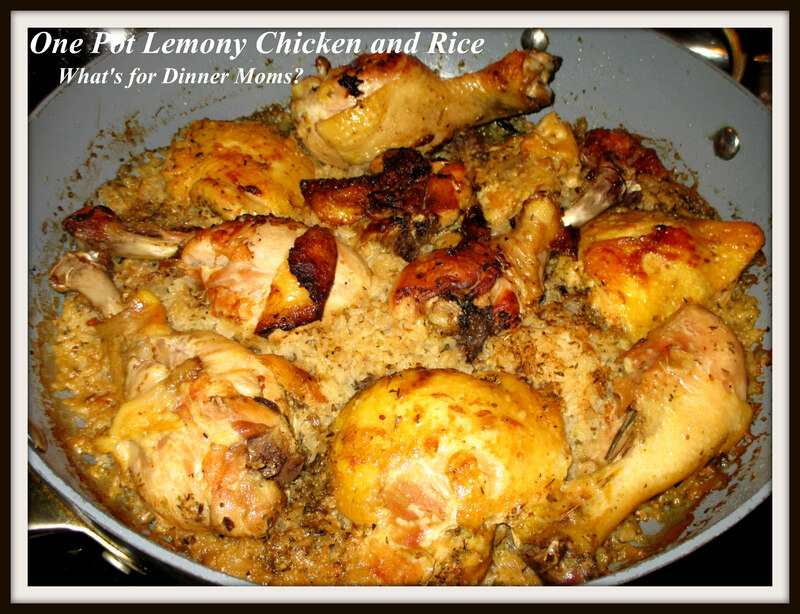 The rice was amazing and the chicken was good with a strong lemony flavor. Marinating the chicken overnight really intensified the lemon flavor in the chicken and it was delicious. We made this with 10 chicken thighs and drumsticks so that there was plenty of leftover chicken. Next time I will double the rice to have some of that leftover too. That was so popular it was all gone by the end of dinner. I served this meal with a green side salad and and green beans. For my mostly gluten-free son this meal was entirely gluten-free. Place the Chicken and other ingredients in a Ziploc bag. Refrigerate for at least 30 minutes but preferrably overnight. Flip the bag at least twice during marinating. To bake: preheat oven to 350 degrees. Remove chicken from marinade, but reserve the Marinade. Heat olive oil in a deep, heavy based skillet that can be placed in the oven over medium high heat. Cook the chicken in the skillet, skin side down, until golden brown, then turn and cook the other side until golden brown. Remove the chicken and set aside. Add the onion and sauté for a few minutes until translucent. Then add the remaining Rice ingredients and reserved liquid from the chicken. Let it simmer for about 1 minute. Place the chicken on top then place a tight fitting lid on the pan or cover with aluminum foil. Bake in the oven for 35 minutes. Remove the lid and bake for a further 10 minutes, or until all the liquid is absorbed and the rice is tender. Remove the pan from the oven and allow to rest for 5 minutes before serving. Garnish with extra oregano, lemon zest and feta cheese if desired. I am crazy about lemon flavors so this recipe sounds delicious. Have a fun week!